Björn Alling, researcher in theoretical physics at Linköping University, has, together with his colleagues, completed the task given to him by the Swedish Research Council in the autumn of 2014: Find out what happens inside magnetic materials at high temperatures. Chromium nitride, CrN, is a magnetic material used in industry as, among other things, a hard surface coating. It is also of interest to researchers, since it is a poor conductor of heat at high temperatures, which makes it suitable for use in, for example, thermoelectric systems. In such systems, the material is to conduct current without conducting heat. The behaviour of chromium nitride, however, is somewhat remarkable at slightly higher temperatures. Nitrides are compounds that contain nitrogen, N, together with one other element. The ability of most nitrides to conduct heat falls slowly but surely as the temperature increases. The heat conduction of chromium nitride, in contrast, falls precipitously after a moderate temperature rise, and then remains at a constant low level, even as the material is heated to 600 °C. The mechanisms behind this behaviour have left researchers perplexed for many years. The past decade has seen major breakthroughs in theoretical research in materials science. Researchers have determined which calculation methods are most accurate, and have gained access to sufficiently powerful supercomputers to be able to carry out the calculations. 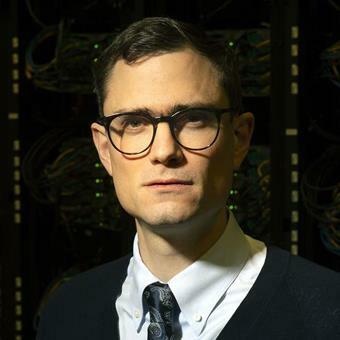 “There has been a major hole in our knowledge in the particular case of how magnetic materials function at high temperatures”, says Björn Alling, researcher in theoretical physics at LiU. It was nearly four years ago, at the end of 2014, that he was awarded a major research grant from the Swedish Research Council to attempt to fill this hole, in collaboration with researchers at the Max-Planck-Institut für Eisenforschung in Düsseldorf. Björn Alling spent two years at the institute, a world-leader in magnetic materials research. The collaboration has been successful and resulted in an article in the prestigious journal Physical Review Letters, where the group describes a new method that has enabled it to calculate exactly what happens in chromium nitride when it is heated. At last we have theoretical calculations that agree with the behaviour of the material. Photo credit Magnus Johansson“We want to understand the materials, independently of their temperature, pressure and composition, and be able to describe them accurately. The theoretical calculations and the methods we have developed give a stable basis to stand on when developing industrial applications. It would have been impossible to determine this basis by experiments”, says Björn Alling. The method they have developed gives results of high accuracy, and this means that the calculations are highly demanding. In solid materials, the atoms are arranged in a well-organised crystal structure, at definite distances from each other. As the material is heated, the atoms start to vibrate. Each atom in a magnetic material contains what can be thought of as a tiny compass needle, a dipole with a positive and a negative end. In classical magnetic materials, such as iron, the needles all point in the same direction, which gives the material its typical magnetic properties. As the material is heated, however, the compass needles start to rotate in an unpredictable manner. Methods are available to calculate and simulate the vibrations and rotations with high accuracy separately, but they predict that the ability to conduct heat will decrease gradually. This is not what happens for chromium nitride. “We have now developed a method in which we describe how the atomic vibrations change on a femtosecond timescale, calculating the forces in the atoms using quantum mechanical methods. To this we add calculations of spin dynamics – how much the magnetism in the atom rotates in a femtosecond. We then put this calculation back into the dynamic model of how atoms vibrate”, Björn Alling explains. “Chromium nitride is remarkable for its low heat conduction at slightly elevated temperatures. We have now been able to show why, and our simulations predict the behaviour accurately. “We have been able to combine a deep understanding of the fundamental physical and quantum phenomena, and we have had access to sufficient computer power. It will be some time before the method is widely used in science, since the calculations are so accurate and demanding, but we must use this method to make progress”, says Björn Alling. The next step will be to apply the method to iron and its alloys. This is one of the oldest materials used throughout human history, but we still don’t have a deep understanding of it. “This is theoretical research with huge practical applications, not least in the steel industry”, says Björn Alling. The research has been financed by the Swedish Research Council, and by the Swedish Foundation for Strategic Research and the Strategic Initiative in Advanced Functional Materials, AFM, at LiU. Irina Stockem, Anders Bergman, Albert Glensk, Tilmann Hickel, Fritz Körmann, Blazej Grabowski, Jörg Neugebauer and Björn Alling, Physical Review Letters 121 2018. The video is texted in English. With seven million Swedish crowns in his pocket, Björn Alling will put his mind to the most fundamental equations of physics: What happens in magnetic materials when things really heat up? Laboratory for Advanced Functional Materials, AFM, contributes at the highest level to the creation of knowledge. The work in highly competitive Centers of Excellence has been evaluated as excellent to outstanding by the VR, SSF, and Vinnova.